Several trends are converging to change the way our food is grown, transported, and sold. Climate change demands that the resources we use to grow, transport, and process food need to be carefully managed. Concerns over the healthiness and cleanliness of our food demand that it is grown, transported, and processed in a sanitary way that preserves its nutritious value. Venture capitalists are increasing their investments into agribusinesses, signaling that innovation may be a high priority for these businesses. Farming innovation activities may qualify for R&D tax credits. In order to meet the many challenges of managing resources used in producing food, farms - principally large corporate farms - need to innovate and deploy new technologies quickly. Water must be carefully managed and machinery must be purchased or configured to operate in managed conditions. The Internet of Things is sure to disrupt and revolutionize farming - crops and greenhouses will likely have large deployment of sensors in order to monitor environmental conditions and manage quality and resource usage. Drone and robotics technologies are also sure to integrate with most farms - automating the labor of planting, harvesting, and cleaning while dramatically reducing the labor needed to survey and monitor field conditions. Fruit and vegetable farming are the most labor-intensive - with much larger labor costs compared to wheat, soybeans, or corn. Advanced robotics may find a way to decrease these large costs. As wireless networks are created on both corporate and small farms, automation and computerization will create conditions to more finely manage and reduce the use of resources and labor. Outside the traditional farm, the urban farming sector is growing rapidly; converting spaces in urban and suburban landscapes into personal and local crop spaces. An entire industry is forming around enabling and providing the technology and tools necessary for people and communities to grow their own food in unsuitable and unlikely places. The research site, Arthaplatform, has the following 2015 outlook of the farming and agricultural sector - the asset class F&A has over 240 investment funds that manage close to $45 billion in assets. Artha sees the spaces in venture capital gravitating towards a mixture of energy, high technology, and biotechnology - all converging into ag-tech - an agriculture technology space. VentureSource, a venture capital news site, reports that venture capital investment in agriculture and food soared 54% to $486 million last year, according to Dow Jones VentureSource. The USDA, through the Farm Credit System - a partnership of the USDA, banks, and lenders that provide credit to the agriculture industry - will direct funds towards private equity efforts in its Rural Investment Business Companies fund. It provides special funds for a specific business type called a Rural Investment Business Company. These funds receive matching dollars for private investment in rural agriculture companies. They are similar to private equity and hedge funds and usually take a 2 percent management fee, and up to 20 percent per year on returns. Some examples include Meritus Ventures, LLP, The Innova Ag Innovation Fund, and Advantage Capital Partners. Meritus Ventures is focused on the Appalachian region. It makes equity investments in expansion-stage companies in rural central and south Appalachia. It's raised $100 million as a RIBC and provides operational assistance, active board participation, and mentoring as part of the USDA-backed RIBC program. Innova is a fund and development group focused on commercializing early stage agricultural innovations., raising $25 million investments in life sciences. They work in three stages similar to a business accelerator; discovering, screening, and protecting novel technologies, licensing early stage agricultural technologies, and taking active roles in managing and providing support for funding, growth, and commercialization. Advantage Capital Partners aims to invest in entrepreneurial small businesses in communities that are underserved by traditional capital sources. It provides bothequity and debt capital as well as operational counsel. Advantage Capital Partners has raised $154.5 million in agricultural technology companies as a RIBC. Paine & Partners is a New York based private equity firm that specializes in food and agribusiness companies and has a portfolio of nine food and agriculture companies. It has raised $893 million in January 2015 for the purpose of boosting productivity in areas such as protein production and food safety. University of California at Davis' AgTech Innovation Fund is a $50 million limited partnership venture capital fund designed to invest in early stage agriculture and life science technology companies. It was formed in 2014 and is now funding startups in Northern California and the central valley of California. Cultivian Sandbox is a venture capital firm that is focused on next generation agriculture and food technology companies. Cultivian wants to be more than just venture capital to an invested company, it wants to actively collaborate and cultivate its portfolio. Cultavian's portfolio consists of 18 companies across two funds. Freight Farms is an ag-tech company that creates mobile farms housed inside of standard shipping containers called Leafy Green Machines. These farms, provided they have water and electricity, act as self-contained greenhouses to nurture small plants contained on mounted racks. They feature customizable remote lighting and environmental controls. These containers are meant to be deployed in urban and suburban areas where farms may not be able to be built or maintained. 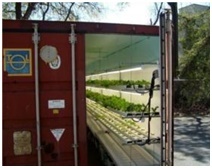 The shipping container housing also makes the mobile farm easy to transport and deploy. Freight farms had a $3.7 million investment from Spark Capital. Agrobot has developed a fruit picking system that uses color sensing to detect and carefully pick ripe strawberries and fruits and leave unripened fruits on the plant. Fruits and berries require a lot of careful labor to bring from field to market, and the costs of leaving fruits in the field are too great to bear. Agrobot's machines could revitalize the threatened fruit and vegetable farms and alleviate the need to import cheap fruit. Modern Meadow Inc. is a bioengineering company that is working on synthesizing animal proteins and tissues in a lab from animal cells through biofabrication processes. Modern Meadows hopes to meet demands for animal meat and leather without having to raise or harm animals and avoiding the environmental impacts that animal farming may have. Modern Meadow has received $10 million in Series A funding in June 2014. Harvest Automation Inc. creates both robots to work alongside farmhands and robots that automate farmhand tasks in order to increase productivity. One of the key targets for Harvest Automation's robots is fruit, berry and vegetable crops. They also create Crop Scout robots to monitor field conditions. Harvest Automation's technologies leverage adaptive robotics methods to provide robots that are small, practical, smart, and sustainable. Harvest Automation is part of Cultivian Sandbox's portfolio and has received $33.5 million of funding in seven rounds from six total investors. Private equity and venture capital firms are increasing the amount of capital they invest in agricultural technology startups to drive the transformational change needed to address the many challenges that rural America faces. In order to overcome these challenges on a practical level, technological innovation will be required. Research and development efforts in agricultural technologies qualify for substantial federal and state R&D tax credits.